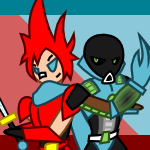 A comic strip series about two titular videogame heroes of two rivaling fictional videogame franchises, parodying and playing with media tropes while at the same time performing their heroic duties. Arth, the brave knight from fantasy-like series "Arth's Quest", and Tech, the snarky cyborg from sci-fi-like series "Cyborg Tech". The comic has finished its run, yet the adventures continue in "Adventures of Arth and Tech". I am a humble, yet proud inspired artist longing for recognition. Every subscription and every comment matters to me. I'm a man of many talents, but for now I'm deep in webcomics. This is actually quite an edearing and cute artstyle. The truth is that the comic deviated too much from the original "gag-a-day" formula, not to mention that I'm much better at writing stories than I am at writing jokes. Have no fear! The adventure comic is already here! Heroes often have standards and morals they strive to uphold, unlike the bad guys, don't they? That's why they're heroes. Villains love to leave in unusual fashion. Some catapult from their machines, some go down the drain, literally, some... just walk through the door. It's fairly often, too.